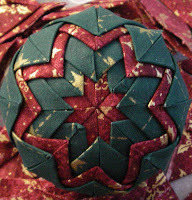 Pin It I love folded star ornaments, I try to make one a year. Here's how I make mine. I wrote these instructions back in 2008 and posted them in a 3 part series. I decided to bring them all together in one posting for a repeat posting.. One year I am going to try and use glue instead of pin or I'd love to find shorter pins. Enjoy! I start out with a bunch of 2.5" blocks. 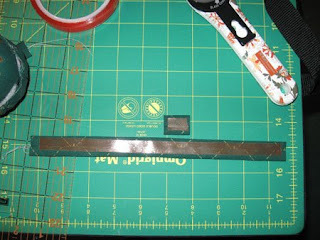 When I first wrote these instructions, I created 2.5" strips and then cut into 2.5" blocks. Now, you could probably cut out a ton of 2.5" blocks with a die cutter if you have one. 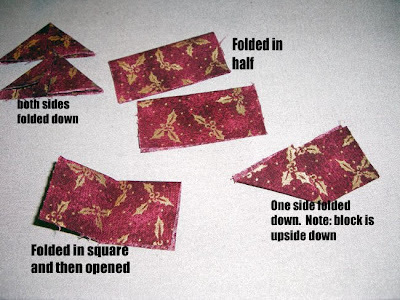 Once you have your tiny twice folded square, you now open it back up to the original half size and then we fold the edges in to meet the center fold line. Think back to when you made your paper hats. You bring the right side into the center fold line and press and then you bring the left side into the center line and press. Or, you fold them both in, hold them with your finger or tweezers and then press at once. Be careful not to burn your finger like I usually end up doing :-) You will end up with mini triangles. 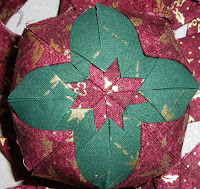 Now it's time to begin pinning the triangle pieces to the star. Keep in mind there are no "must follow rules" they are all left up to your individuality and how you would like to arrange the layers. Also, things won't match up perfectly. That's OK, slap on another layer and cover up the imperfection :-). Most of all, make it your own. 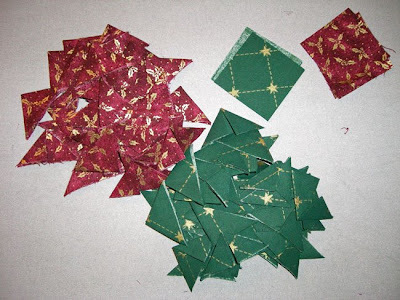 Place two of the unfolded squares evenly spaced apart on the foam. Pin each corner and have the corners meet from each side evenly spaced apart. Layer 1 Step 1 - Place your first triangle directly on the flat 2.5" square just placed. Match the wide edge of the triangle with the corners of the squares. Pin the corners first and then the point. 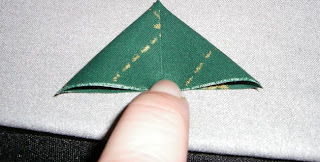 Remember, place the pin in the point in between the two folds a little below the edge. Then pull the folded flaps up and over to hide the point pin. Layer 1 Step 2 - Complete the second triangle directly across from the first one placed, same method. Layer 1 Step 3 - Place the 3rd triangle in the empty space besides the two just placed, match points. 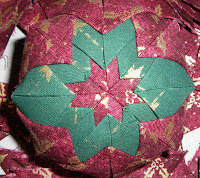 Layer 1 Step 4 - Place the last triangle to finish the square. All points should match up. 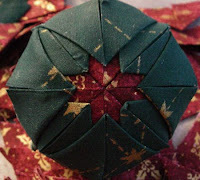 Next layer, decide how large you want your center star. 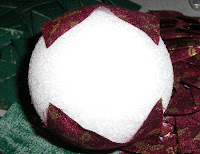 You should be able to fit 3 or 4 layers without using half the foam ball's space. 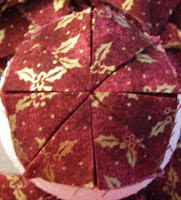 Layer 2 Step 1 - When you decide where you would like to start layer two, place in the point pin first and then pin down the outer corners of the triangle. Layer 2 Step 2 - Place the second piece completely opposite of Layer 2 Step 1. Pin center, hide pin, pin corners of triangle. Layer 2 Step 3 - Place the third piece 90 degrees from pieces 1 and 2 from layer 2. Pin center, hide pin, pin corners of triangle. Layer 2 Step 4 - Place the 4th piece directly opposite of piece 3. Pin center, hide pin, pin corners of triangle. Layer 2 Step 5 - Now add a 5th triangle to the areas not covered by the 4 pieces of layer 2. It's almost like another layer of the same color. You are now starting to form your star. Pin center, hide pin, pin corners of triangle. Layer 2 Step 6 - Place the 6th piece completely opposite of Layer 2 Step 5. Pin center, hide pin, pin corners of triangle. Layer 2 Step 7 - Place the 7th piece 90 degrees from pieces 5 and 6 from layer 2. Pin center, hide pin, pin corners of triangle. Layer 2 Step 8 - Place the 8th piece directly opposite of piece 7. Pin center, hide pin, pin corners of triangle. You should see your first star. 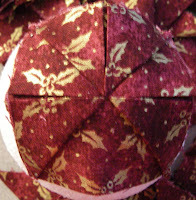 Layer 3 Step 1 - When you decide where you would like to start layer three, place in the point pin first and then pin down the outer corners of the triangle. Layer 3 Step 2 - Place the second piece completely opposite of Layer 3 Step 1. Pin center, hide pin, pin corners of triangle. Layer 3 Step 3 - Place the third piece 90 degrees from pieces 1 and 2 from layer 3. Pin center, hide pin, pin corners of triangle. Layer 3 Step 4 - Place the 4th piece directly opposite of piece 3. Pin center, hide pin, pin corners of triangle. Layer 3 Step 5 - Now add a 5th triangle to the areas not covered by the 4 pieces of layer 3. It's almost like another layer of the same color. You are now starting to form your second star. Pin center, hide pin, pin corners of triangle. Layer 3 Step 6 - Place the 6th piece completely opposite of Layer 3 Step 5. Pin center, hide pin, pin corners of triangle. Layer 3 Step 7 - Place the 7th piece 90 degrees from pieces 5 and 6 from layer 3. Pin center, hide pin, pin corners of triangle. Layer 3 Step 8 - Place the 8th piece directly opposite of piece 7. Pin center, hide pin, pin corners of triangle. You should see your second star. If you have room for another layer without going over the half way point of the foam ball, switch colors and repeat steps from Layer 3. Once you are done with all your layers, I sometimes go back and pin down all the exposed outer edges in prep for the ribbon or fabric wrap that will hide all the pins. 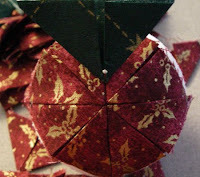 When finished, flip over the ornament and repeat all steps. I like to use opposite center color and then build out. 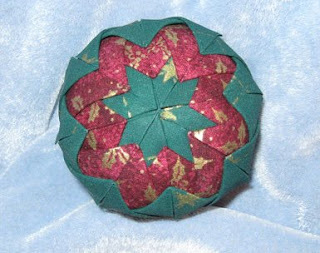 I finished pinning on the second side of my folded star ornament. I decided on the second side I would only place 3 layers of fabric. However, I started the center in green this time. 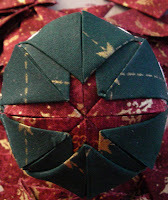 So, when I was finished, both sides met with the green fabric. Here are photos of both finished sides. Where the sides meet is where you will place your fabric strip or ribbon. Most times, my sides don't match up perfectly. But like I referenced previously, who cares. It's going to be covered up with fabric anyway. I just make my fabric strip a little wider to make sure I cover it all. Here are my sides. See how at one spot, they overlap a little and in another, there's a nice gap. 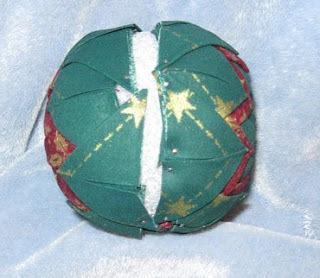 Wrap a string or measuring tape around your ornament to determine the size of ribbon or fabric you need. For this size foam ball, I'll need a 10" strip to be exact. However, I like to add a couple inches to that in case I have any issues and to make a tube at the top to act as a hanger. I usually use matching fabric (or contrasting, depends on the mood :-) 2" wide strip. Then I fold the strip in half, right sides together and stitch a 1/4" seam down it to make an inside out tube. 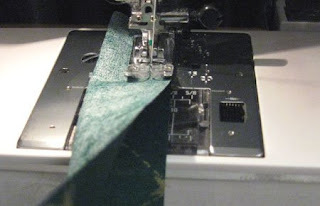 Turn the tube right side out and press with the seam on the inside, bottom center of the strip. I end up with a 3/4" finished strip to wrap around the ornament. Optional instructions - Just fold the sides in (1/4" each) to the back center and iron to make a 1.5" strip with sides folded under. 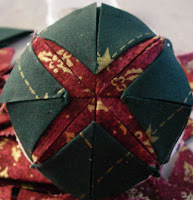 Then, fold this in half again to form the 3/4" strip. This hides the raw edges and still gives you the 3/4" strip to wrap around the ornament. I cut the finished strip to 10" (or however long you need) and then from the excess piece I cut a 1" piece which I'll use later. On the 10" strip, I add double stick tape. Then carefully thread the one end through the 1" piece and secure with tape on the underside. This will be the hanger at the top of the ornament. 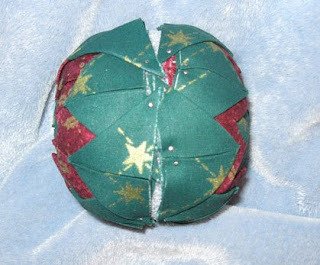 Place the area with the 1" piece on top of your ornament if you have a preferential "top". 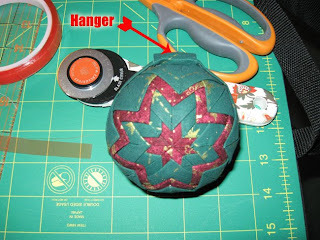 Wrap the piece around your ornament and secure. 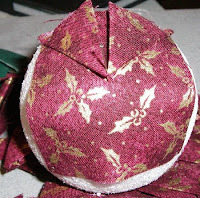 When you come to the top, feed the other end of the wrap into the 1" piece on the top of your ornament. I'll even reach in with a pin inside this piece and secure further. Now, your ornament is ready for hanging. 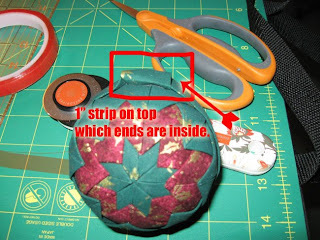 Optional instructions - just use the 10" strip and tape it to the ornament letting the ends meet at the top. 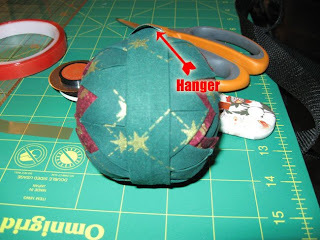 Glue on a piece of fabric on top to cover the joint of the two ends where they meet at the top. 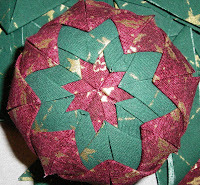 Adhere something to hang the ornament.Here's the finished wrap. I like using fabric because the wrap is then very smooth. Hang on your tree or give as a gift! Please let me know if you have any questions. I have done these. 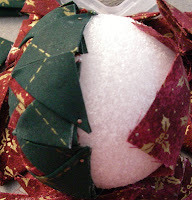 Instead of wrapping the piece of material around it, I used Christmas ribbon about 1 to 1.5 inches and wrap it. Then I just folded the ribbon into 3 waves the middle one long enough to use as a hanger. I loved this tutorial for cutting and placing the pairie points. 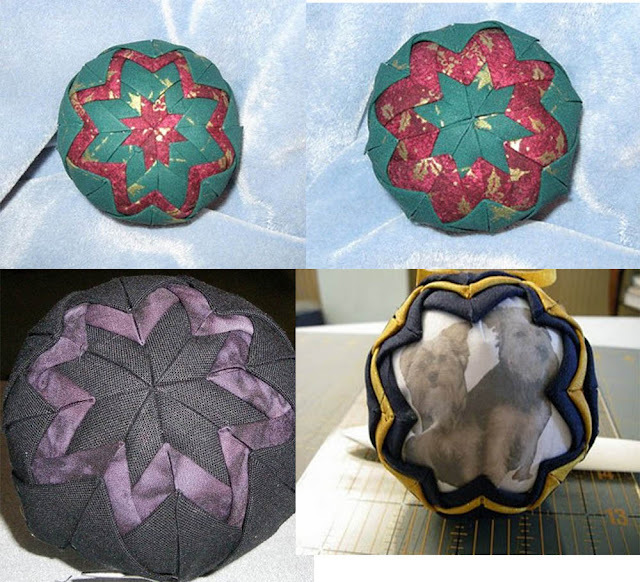 To pin the ribbon down and make it more festive, used pins with colored heads to match the design. Usually white, red, blue or green. I have made these as well and theyare always a hit with family and friends. 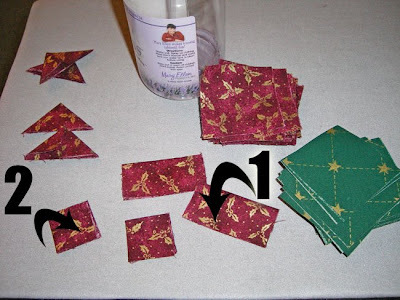 I use Aida cloth folded and use counted cross sstitch to stitch a name and date on them or a phrase, such as Merry Christmas or the Book and verse of the Christmas Story. 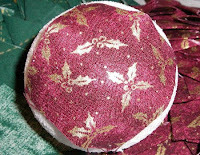 I have made a few dozen - each with different Christmas fabrics. I hang them on my table tree as the main ornaments. I really enjoy the look! I measure off the "equator" with a rubber band and pencil, then measure from there up and down on both sides of the ball so that I have 3 sections. Then I pin North, then South, East and West for the first row as you do. It is easy to tell students with NSEW with all the top points coming together with one pin. 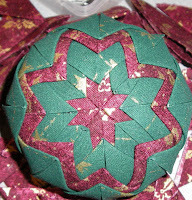 I glue as I go and leave the pins in as I am working to set the triangles, removing pins when necessary. 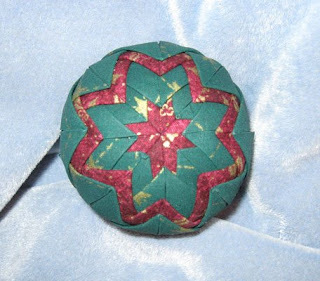 I use a 3" ball, usually 4 rows on each side of 2 inch squares. At the Equator, where the two halves meet ( or almost meet! ), I use some narrow two sided lace I make by sewing two pieces of lace together and then cover the middle of the lace with a 1/4 inch ribbon, all of this being glued as I go. The only pins left ( I replace the first pins by pearl pins ) are at the N and S Poles!! 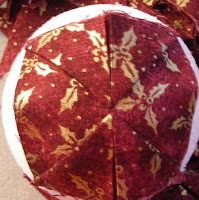 and on the bows at the top and bottom of the ball to fasten the ribbon. These pins are the pearl pins, either balls or tear drop shaped. 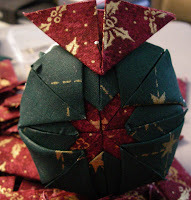 You can do the same thing with the egg shaped styrofoam, just fill in at the ends with extra fabric triangles. The egg shaped ones are really nice on a Christmas tree as well as at Easter. I've been using a drop of glue instead of the pins. My fingers thank me. Use sequin pins they are shorter. Use sequin pins, they are a lot shorter than regular pins. and use a thimble to push them in. I used a leather thimble, covers my whole finger. you can find them in the quilting section.